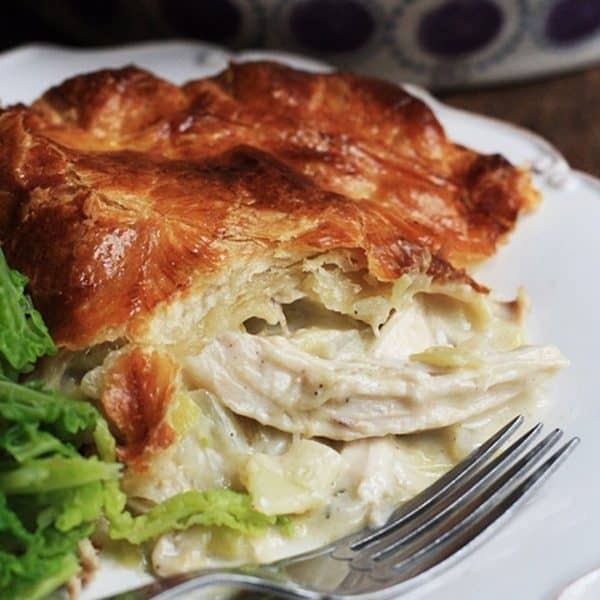 Chicken and Leek Pie is a family favourite with a creamy chicken, garlic and tarragon infused buttery sauce. What is November without a good pie? Cold, that’s what. Is there really any better internal heating system that a plate full of hot bubbling creamy chicken and sweet leeks adorned with a crisp and flaky buttered hat? 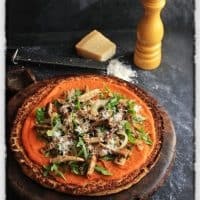 The best part of any pie is of course where the lid meets the sauce, so that the puff pastry becomes chewy and saturated with all the beautiful flavours. 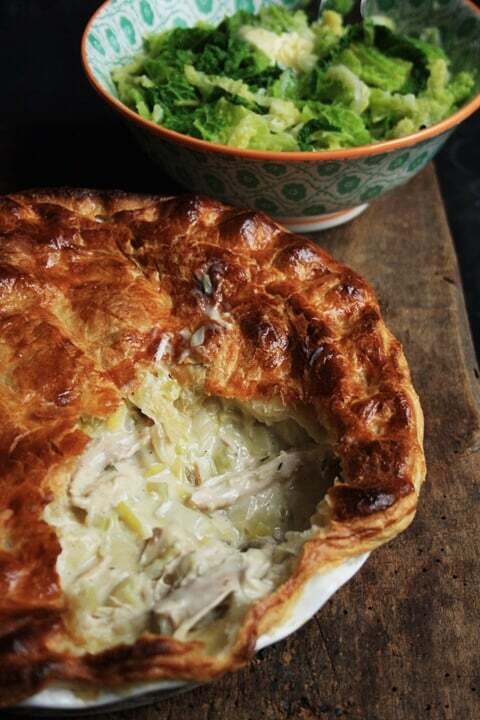 I have been making this pie for years, it’s a complete crowd and family pleaser, equally at home as part of a special mid-week treat or pride of place at a small supper gathering. 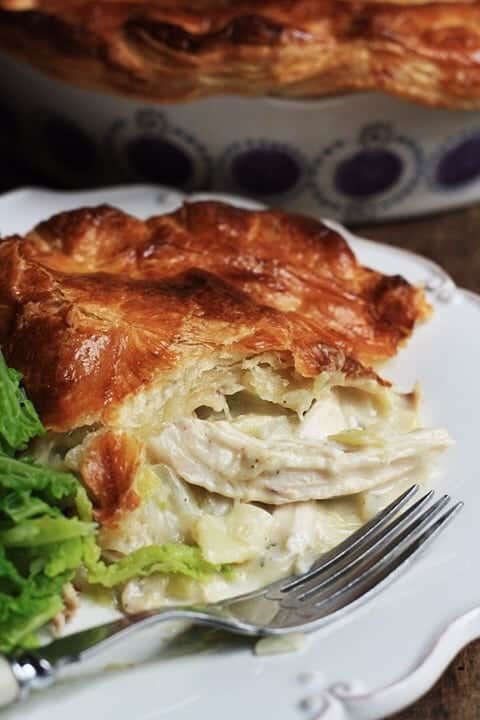 It is chock full of chicken flavour because you poach a whole chicken with a host of vegetables to cook the chicken off first, then use the deliciousy deep stock as the base of the pie filling, thickened with sweet rice flour then finished off with a generous amount of crème fraiche. Using crème fraiche instead of cream is second nature to me as I am a complete crème fraiche addict. I love the way it adds richness but is its own tempering agent, adding a tang which is complimented here by the addition of lemon zest and tarragon. You won’t need all the stock produced for the pie filling but that’s all the better so you have it to hand for your next recipe. There are a few steps involved in this pie which is why I have absolutely no qualms about using shop bought gluten-free puff pastry. Don’t feel that you have to do all the steps of the pie at once either. Poach the chicken the day before, or make the filling the day before. It’s a recipe that can happily be broken down into manageable chunks. Of course the obligatory accompaniment to pie is quite obviously mashed potato but don’t let that become your go-to every time. 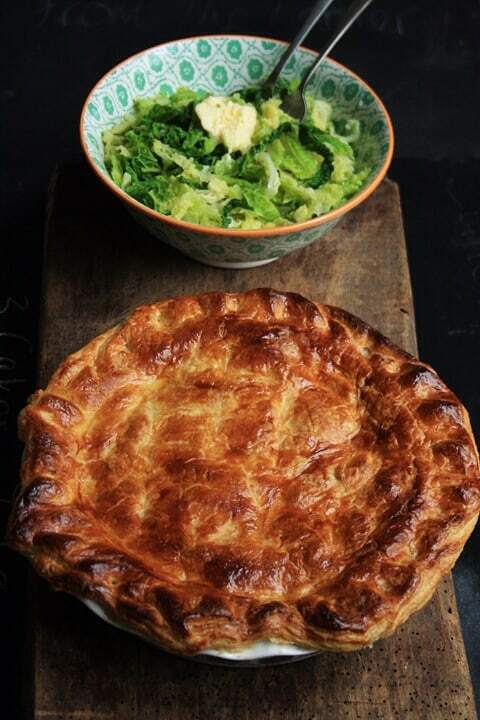 I love a bit of white rice with this pie, especially if you serve it with a mound of buttered broccoli. If you are going the mash route then make sure you don’t forget the greenery, shredded savoy cabbage with a glistening diamond of butter on the top. For a lighter meal then forgo the carbs entirely, as long as you have the greens to eat with your pie then you’ll be a happy camper. Remove the string and giblets from the chicken then place the chicken in a large stockpot with the onion, leek, carrots, celery, garlic cloves, bay leaves, thyme and parsley stalks. Fill the stockpot with cold water so that it covers the chicken, season well with salt and black pepper and bring to the boil. Turn the heat down to simmer for 1 hour. Remove the chicken from the stockpot and set aside until cool enough to handle. Meanwhile continue simmering the stock for a further 1 hour. 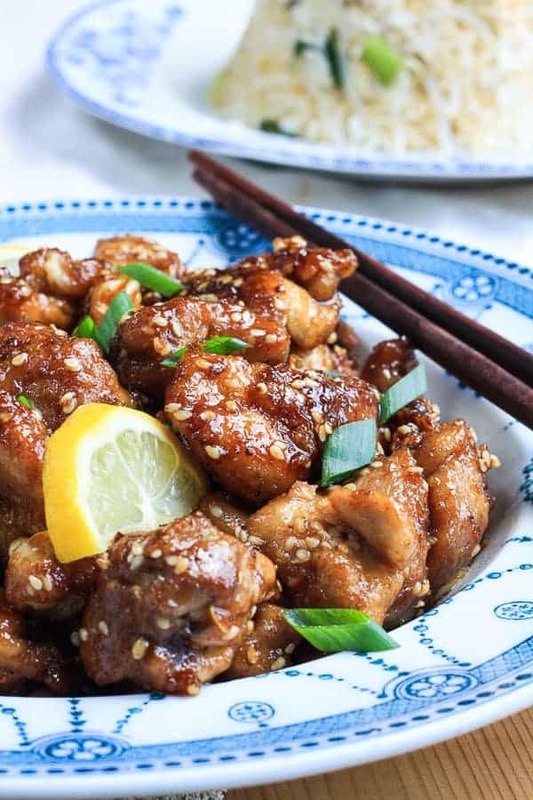 Shred the chicken away from the bones. Discard the skin and all the bones and set the meat aside until you need it. Remove the stock from the heat, strain and discard the vegetables. Set the stock aside until you need it. Heat the butter and olive oil in a large saucepan until the butter has melted. Add the onion and celery to the pan and fry gently for about 10 minutes when the vegetables start to turn translucent. Add the leeks, garlic, lemon zest, tarragon, thyme leaves and the bay leaf to the pan. Give everything a good stir then continue to fry gently for 15 minutes or until the leeks are softened. Add the sweet rice flour and mix well into the leeks until all the flour has been absorbed by the mixture. Stir continually with a wooden spoon letting the flour cook through for a few minutes. Pour in the vermouth and continue stirring for a couple of minutes until the wine has been absorbed. Pour 400ml of the stock into the pan. Stir continually until the flour dissolves into the stock and the sauce is thick and bubbling. Turn down to a simmer for 10 minutes. Add the poached chicken and the crème fraiche and season well with salt and pepper. Bring the mixture to a gentle simmer. Take the ready-rolled puff pastry and cut a thick strip to place on top of the lip of your pie dish. Then place the rest of the pastry on top, cutting away the excess. Tuck onto the pie filling and pinch to the pastry on the lip of the dish. Whisk the egg and then brush over the top of the pie. Place the pie in the middle shelf of the oven and bake for 15-20 minutes until the pastry top is golden brown.